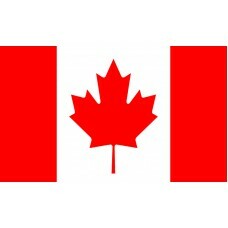 The Canadian flag consists of a white square with two red vertical rectangles on each side and a red maple leaf in the center of the white square. Red and white are the only colors that are used on the flag as they are the official colors of Canada which were instituted by King George V of Britain in 1921. The red color represents the English cross of St. George and the white color is symbolic of the French Royal Emblem. The 11-pointed maple leaf used on the Canadian flag was designed by George Stanley and has been a national emblem of Canada since 1868, when it was used on the coat of arms. The Canada Flag was adopted on February 15th, 1965 and is often referred to as "The Maple Leaf" or "L'unifolie," which translates as "one-leafed" in French. In 1763, Canada became a British colony and from this period until they adopted their own flag, the Union Jack was used as Canada's national flag. Even when Canada gained independence from Britain in 1931, the Union Jack was still used. 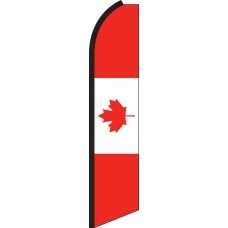 In 1964, the Prime Minister announced that Canada should have its own flag, which sparked a huge debate, which resulted in favor of a new flag. The flag was raised for the first time on Parliament Hill in Ottawa. On February 15th each year, national flag day is celebrated. From the 16th century, both the British and the French established colonies in Canada and land disputes between the countries led to four wars between 1689-1763. As they were a British colony, Canada was also involved both in World War I and World War II as British allies. 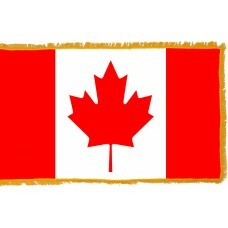 Canada officially became a country on July 1st, 1867 when the British North America Act was passed. It is located in North America and is the second largest country in the world. Its capital city is Ottawa and it has 10 provinces and 3 territories. Canada boasts the longest land border with America as well as the longest coastline in the world. It has more lakes than anywhere else in the world with Ontario having over 250,000 lakes on its own. The lakes in Canada make up 1/5 of the world's freshwater lakes. It is also home to many beautiful and fantastic sights, such as the Rocky Mountains, Montreal and Quebec (amongst many others), which has made it one of the most popular tourist destinations in the world. The Niagara Falls (largest waterfalls in Canada) is the most popular attraction that Canada has with thousands of tourists visiting each year. Another very famous landmark is Toronto's CN Tower, which is one of the tallest structures in the world as well as Yonge Street, which is the longest street in the world at 1896km. The weather in Canada is generally cold with the average daily temperature at minus 5.6 degrees centigrade and the lowest temperature every recorded at minus 63 degrees centigrade, recorded in a village called Snag in Yukon in 1947.